Pre-lit Woodland Christmas Garland - Grandin Road by Grandin Road at Two Clock. MPN: 30061. Hurry! Limited time offer. Offer valid only while supplies last. Garland has 500 branch tips that add density and realism. Garland features 100 commercial-quality, 3000-hour lights and plugs into a standard outlet. Garland has 500 branch tips that add density and realism. Garland features 100 commercial-quality, 3000-hour lights and plugs into a standard outlet. Suitable for outdoor use. Cordless Pathway Trees (50 lights per tree; 2 D batteries required per tree) are sold in pairs. Cordless items feature a 6-hour timer that turns on/off at the same time every day. 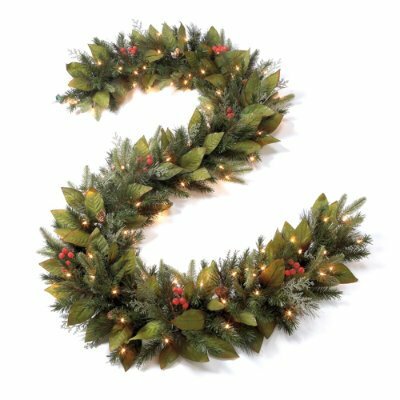 Our luxurious and pre-lit Woodland Collection gives your display a professional look with an abundant mix of all-weather, fade-resistant evergreen, richly punctuated with vibrant magnolia leaves, berries, and real pinecones. Each piece is generously lit with white mini-lights that are made to shine for years to come.. . . . . Shaping is required to achieve a full and lifelike look.